Think of a mountain refuge in the French Pyrenees and I doubt whether outstanding gastronomy is the first thing that springs to mind. However, in one exceptional refuge in the mountains of the Ariege Pyrenees in SW France, gastronomy goes hand in hand with adventure. The Pyrenees mountains which form the natural border between France and Spain are a hiker’s dream. The terrain is rugged and wild and the high mountain hiking is challenging. But the reward for your efforts are far-reaching vistas of a blissfully unspoilt and undiscovered landscape. The fact that over 40 brown bears as well as ibex, chamois, bearded vultures and Egyptian vultures have settled in the central Pyrenees is testament to the wildness of this breathtaking area. 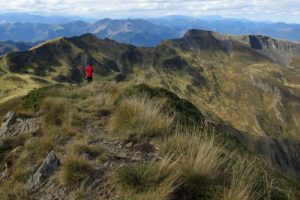 There are a seemingly infinite number of possibilities for multi day hiking circuits in the Pyrenees which you can choose to undertake either self-guided or using the services of a local guide who has indepth knowledge of the terrain and the weather systems. We believe that local knowledge is invaluable in this kind of challenging environment. Read here why local guides are worth their weight in gold. There are numerous catered refuges dotted throughout both the French and Spanish Pyrenees mountains. From June to October, once the snows have receded, the dedicated guardians welcome weary hikers and mountaineers with food and a bed for the night. Staying in a mountain refuge is always a hugely sociable occasion. The evening meal is a ‘one meal for all’ affair, taken with fellow outdoor enthusiasts at a communal table where you can share tales and discuss your mutual love of the mountains. Refuge accommodation is always bunk-room basic and showering facilities may be limited. 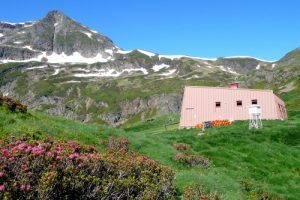 If you’re considering a stay in a mountain refuge in the Pyrenees read here about what you can expect from the experience. 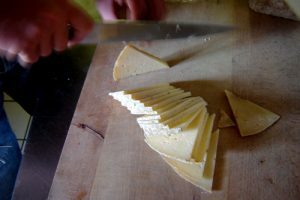 But when it comes to feeding his hungry hikers, Anoura, the guardian at the refuge d’Araing in the Ariege Pyrenees, offsets this no frills accommodation with a hospitality and a passion for food and his environment that is quite frankly extraordinary. The majority of refuge guardians content themselves with providing staple casseroles and other hearty mountain food for the evening meal which serves to satisfy the stomachs of their hungry clíentele. However, Anoura, who has been the guardian of the refuge for 17 years, is different. He doesn’t just want to fill your tummy. He and his equally dedicated team are intent on delighting and surprising your taste buds! He is passionate about supporting local producers and uses horses and donkeys to transport fresh local supplies up to the refuge from the valley below. With its 1200m of ascent this is no mean feat! On your hike up from the valley you may encounter the pack animals laden with huge rounds of cheese from the Bethmale valley, produced from the milk of sheep and cows that have feasted on rich summer pastures. 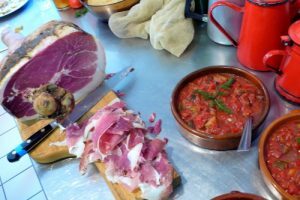 They’ll also be carrying freshly churned butter, legs of cured ham, organic bread that is made by hand and baked in a wood-fired oven and of course fresh seasonal fruit and vegetables from his favourite producers. If you’re lucky the consignment may even include trout, freshly caught that morning! Otherwise, meat is from from local farmers who actually care about the rearing of their animals. ‘Eat local’ is very much at the heart of Anoura’s philosophy. But it doesn’t stop there. Anoura and his team painstakingly collect edible fruits, herbs, leaves, flowers and roots such as wild thyme, gentians, wild liquorice and of course bilberries from their surroundings. Their passion is to transform them into the most divine and unusual cordials, syrups, wines, liqueurs, sorbets, ice creams, jams and jellies which are offered to you during your stay. 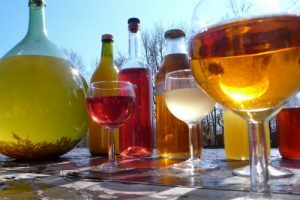 Taste the outstanding elderberry or gentian wine or indulge in a post-dinner wild liquorice or wormwood liqueur which is prepared by the distillation or infusion of many aromatic mountain plants and flowers. 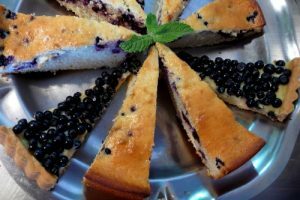 In July and August, using a comb-like collector, the team harvest tiny bilberries from the low growing shrubs around the refuge. 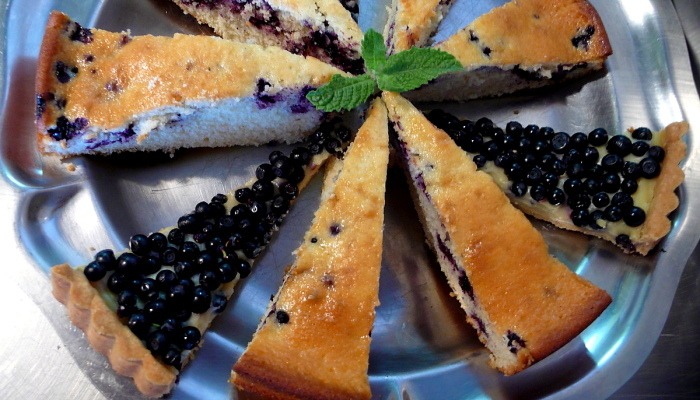 These may then be transformed into a mouth-watering ‘tarte aux myrtilles’ for the evening meal’s dessert. Just divine when accompanied by some home made ice cream or sorbet. After a strenuous hike and an ascent of one of the surrounding peaks on a hot summer’s day, you’re sure to appreciate a glass of refreshing wild mint or lemon verbena cordial, or a scoop of acacia, wild thyme, wild liquorice or bilberry sorbet. Simply delicious! Gourmet mountain fayre is the name of the game at this exceptional lakeside mountain hideaway. Combined with the outstanding hospitality of Anoura and his team you have the recipe for an unforgettable stay which is sure to be the highlight of your hiking trip to the central Pyrenees. The refuge features on a number of our multi day hiking trips including the Ariege-Aran 5 day circuit.